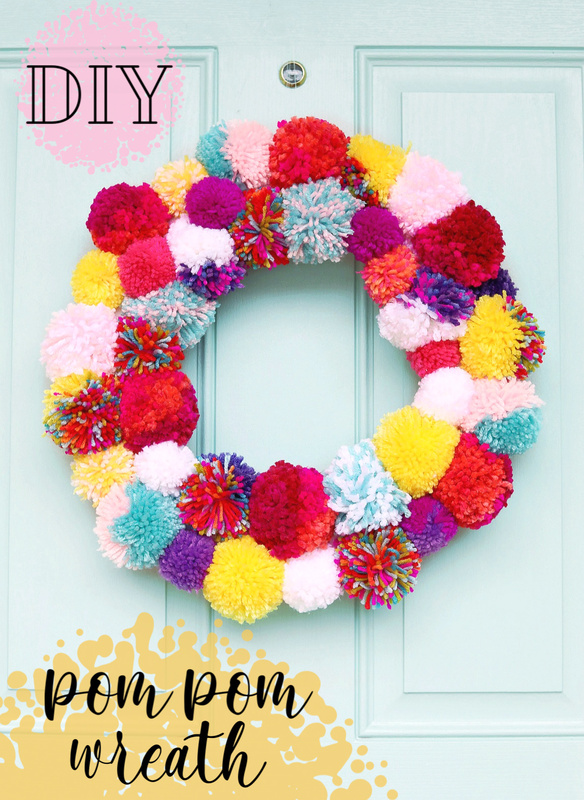 DIY Pom Pom Wreath: Perfect pop of color! 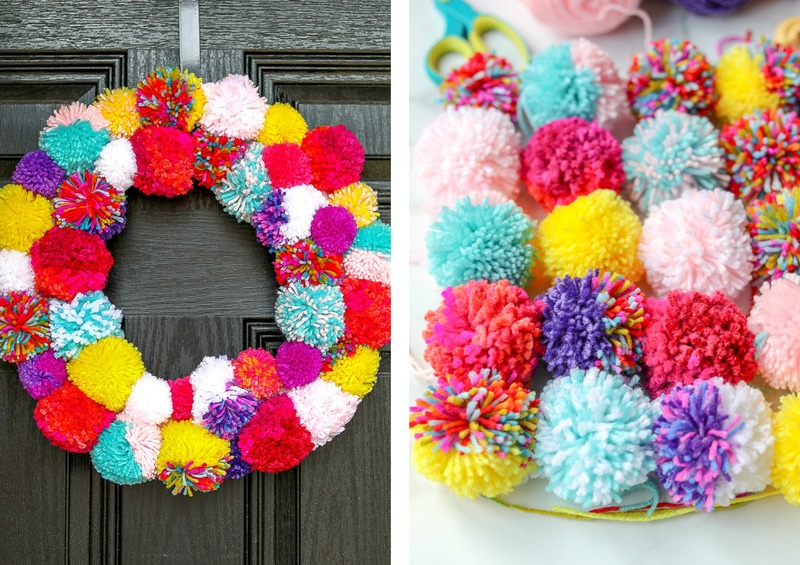 If you haven’t made pom poms yet, you’re in for a real treat. 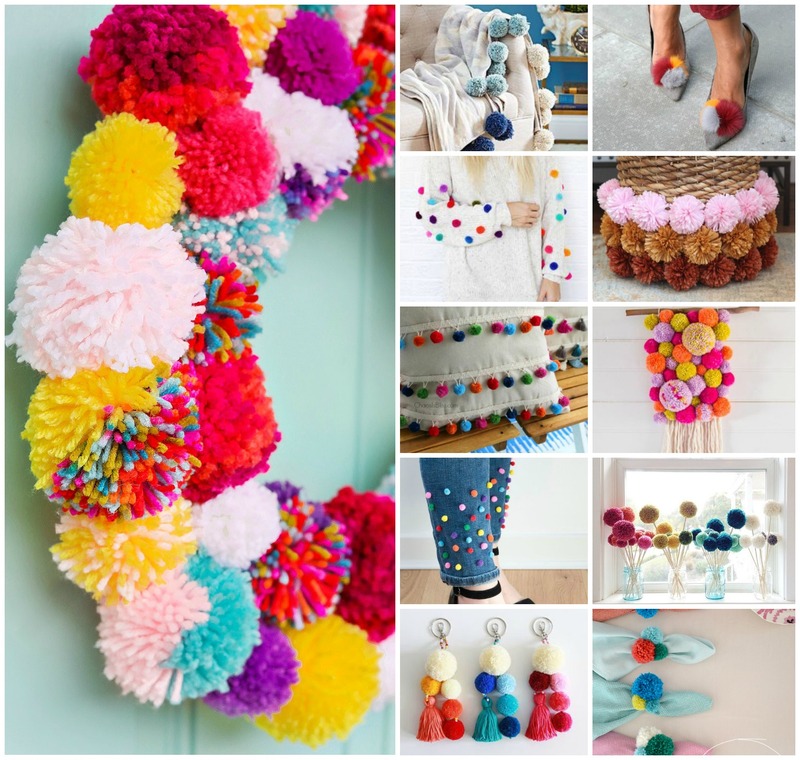 I can’t wait to add pom poms to my sandals, hats, key chain, picnic basket, and knit pillows! Making these were a bit therapeutic. While my goal this year was to buy fewer things, it was also to create more. 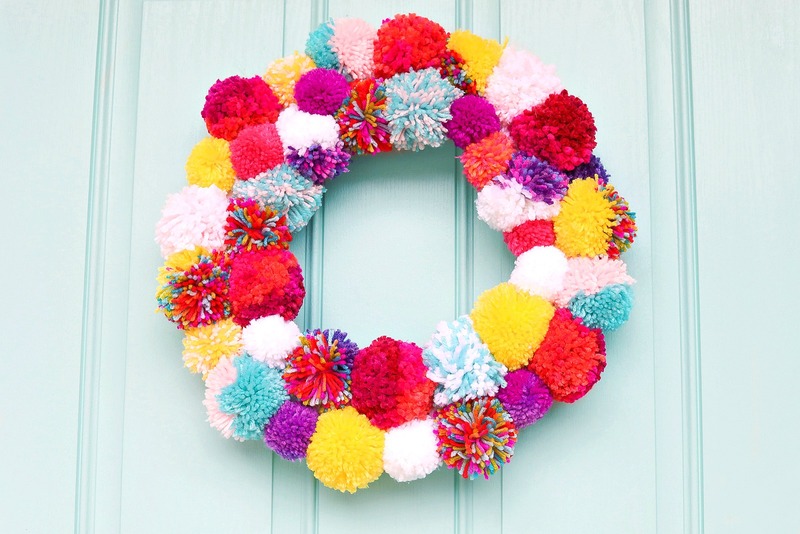 Buying a pom pom wreath would be convenient, but it wouldn’t be as rewarding. 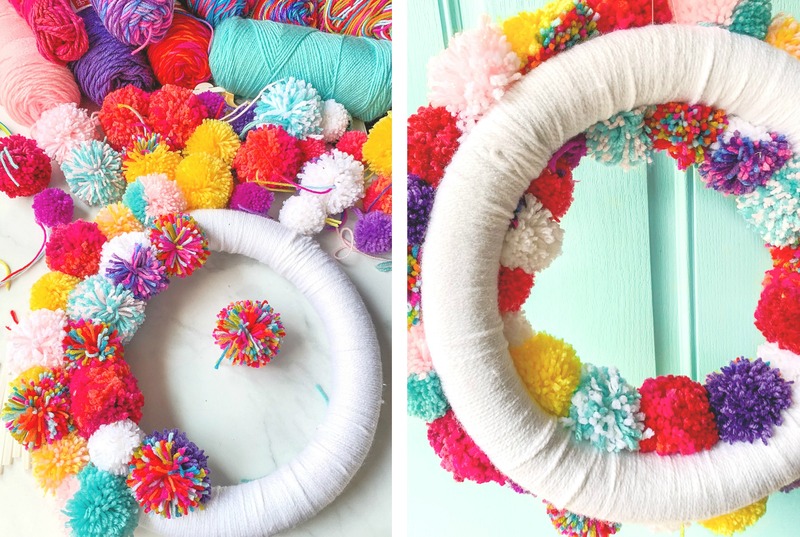 When I look at this wreath, I think of the long hours I spent creating all of the poms, and it makes me happy. Plus, have you seen how expensive these are on Etsy? Although, to the seller’s defense, it did take a long time to make all the pom balls. I’m looking forward to creating a few more as gifts this year. I’m going to make my mom one with shades of beige and light blue to match her living room. Now, this was my first attempt at the pom wreath and I’m not too happy with the colors I chose, but I have a feeling my second attempt will turn out. I have a heart-shaped wreath that is just waiting for some Valentine’s Day colored poms to be glued on it! If you plan on getting your supplies at Hobby Lobby or Michaels, make sure to go online and get their 40% off coupon first! And don’t forget to go to the sale aisle because they are always filled with yarn. Like I mentioned before, the poms will take some time to do. They are so easy and relaxing to make, but you’ll need a ton of them in order to fill a 16” wreath. 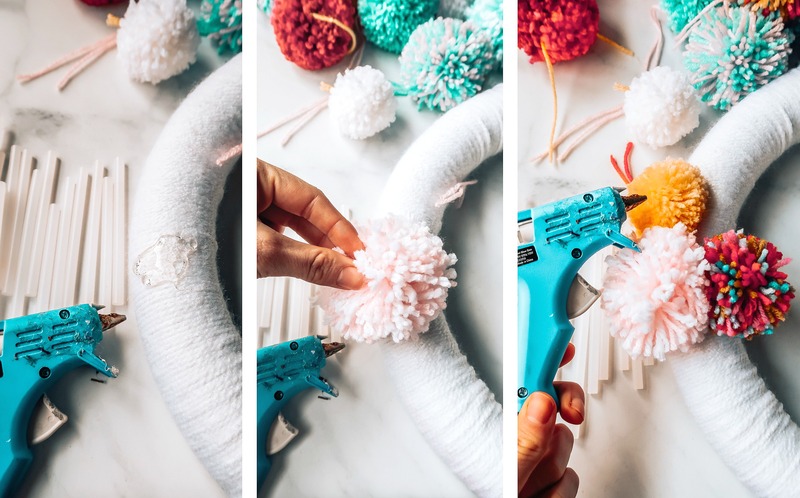 I made 45 poms with the two middle-sized pom makers. I watched an entire season of Schitt’s Creek (3rd time watching this show) and still wasn’t done. Next time, I’ll have a better game plan when it comes to which pattern I create and the colors I use. I wanted it to be colorful like the one I saw on DIY in PDX, but I think I’ll make it bit more subtle next time. There is a couple of different wait to get colorful looking poms. One easy way is the buy multi-colored yarn. I used to wonder why craft stores needed so many aisles of yarn, but after finally doing a project that involved yarn, I totally get it now. I’m afraid I have the itch to start diving into knitting, but that also looks intimidation. You’ll have to let me know if you knit or have ever tried. My friend, Becca, is so good and it so maybe she’ll be able to teach me. 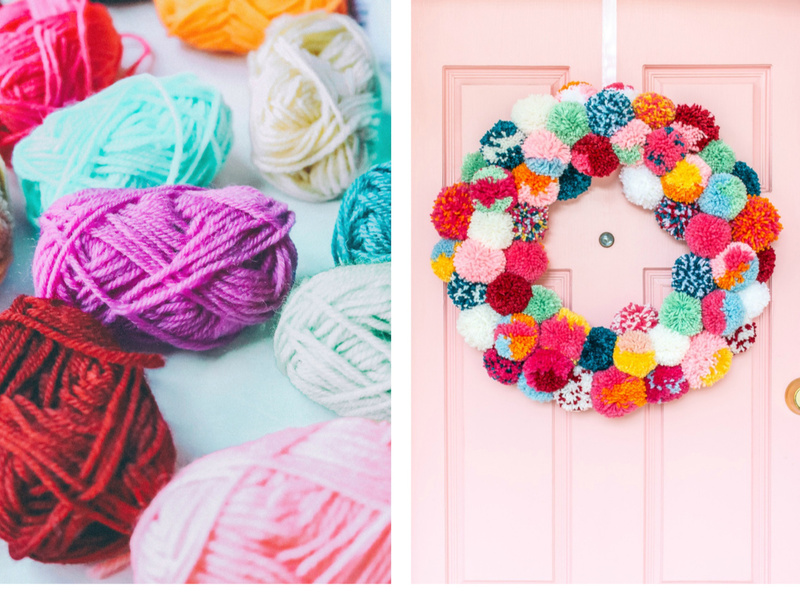 My ultimate goal is to knit a blanket and add these giant poms on the corners. They sell similar ones at Pottery Barn and Anthropology. You can watch a quick tutorial on YouTube to get a feel for how to make these, but it’s as simple as it looks. 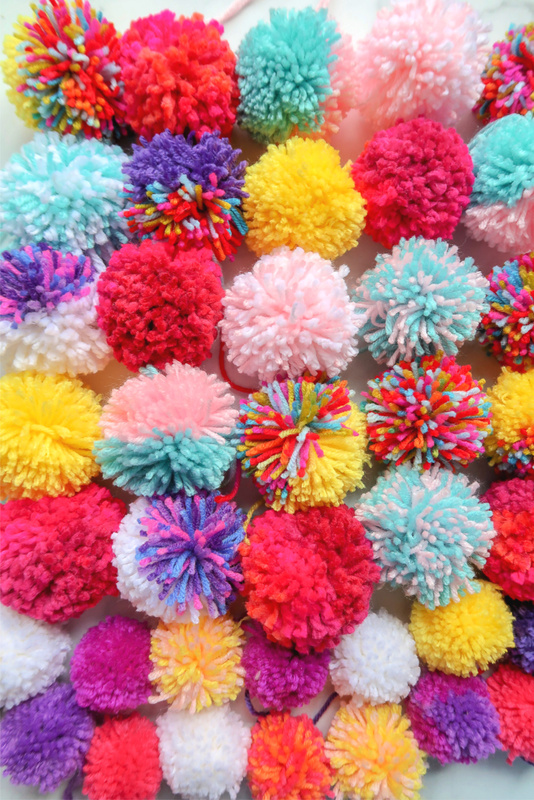 Here’s the tutorial I watched before diving into these poms! 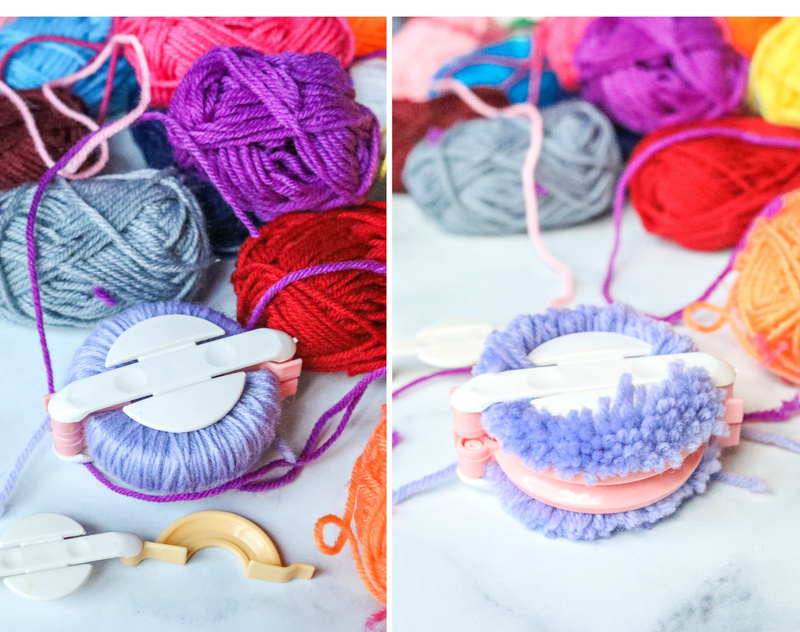 For my color block poms, I added one color to one side and another color to the other side. It worked perfectly. You can also choose two colors of yarn and double wrap the maker for the speckled look. 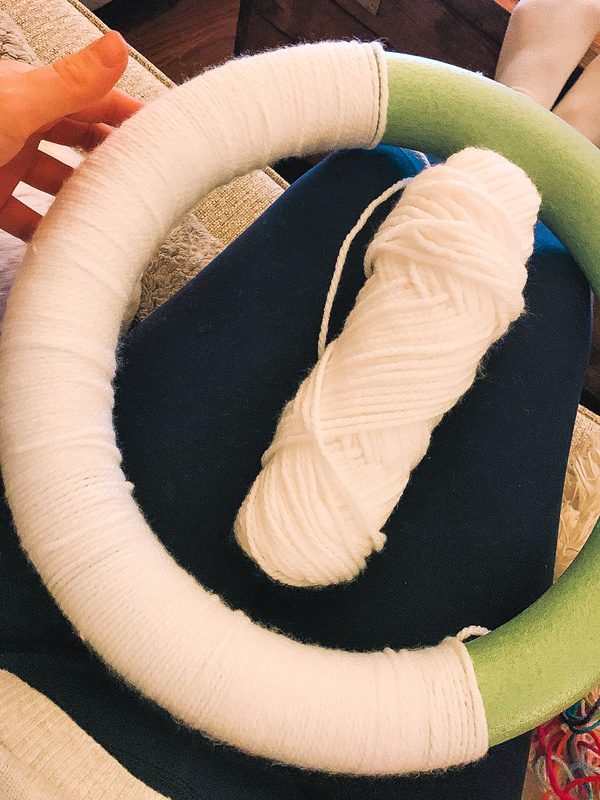 This is honestly the best project to do while watching a movie because you don’t really have to concentrate too much, but you’ll just be doing a lot of wrapping. I wrapped the styrofoam wreath with white yarn. This helps the poms stick better, but also makes it much prettier than having green styrofoam popping out. When you see the back of the wreath, you’ll see what I mean! 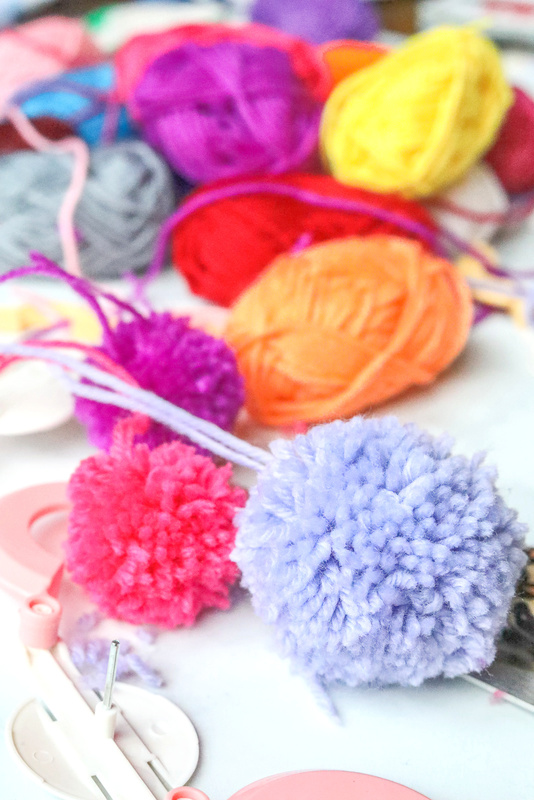 After you’re done making all of the poms (*cough* one day later) you’ll want to lay them out in the order you plan on gluing. You don’t want to be left with three yellow poms at the end of it because you’ll have to pull the yarn out and start making more poms to fit the pattern. Don’t be stingy on the glue. I added a quarter-sized glob for each pom. 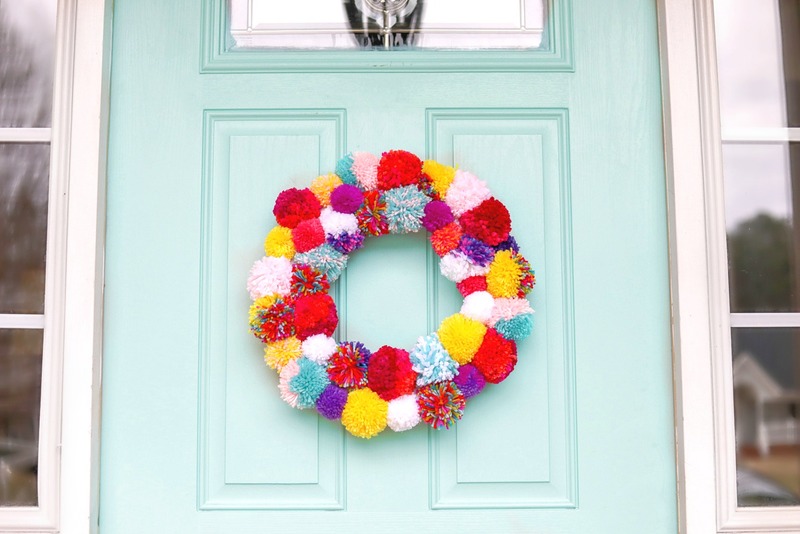 You’ll want to let the wreath dry for a good hour before hanging it up. Now, you can see why covering the foam is important! How about that for some color pop!? These are great for game-day wreaths. 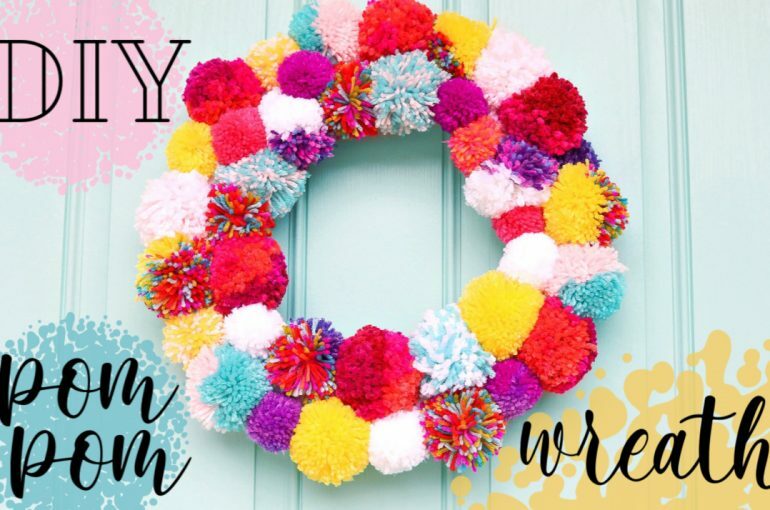 You can make the pom wreath your favorite teams’ colors and add a giant bow! The POMsibilities are endless!!! 😊 I have soo many pom projects to get to thanks to Pinterest! 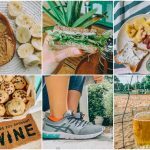 Do you want me to do more DIY on the blog? What colors should I do next? If you answered yes to question #1, what shall I DIY next? I’m a crazy knitter. It’s so easy and so relaxing! I’ve been making poms randomly because I think its fun. (Even got my husband doing them. He loves it!) I’m going to def try and put a wreath together. Yours looks great! 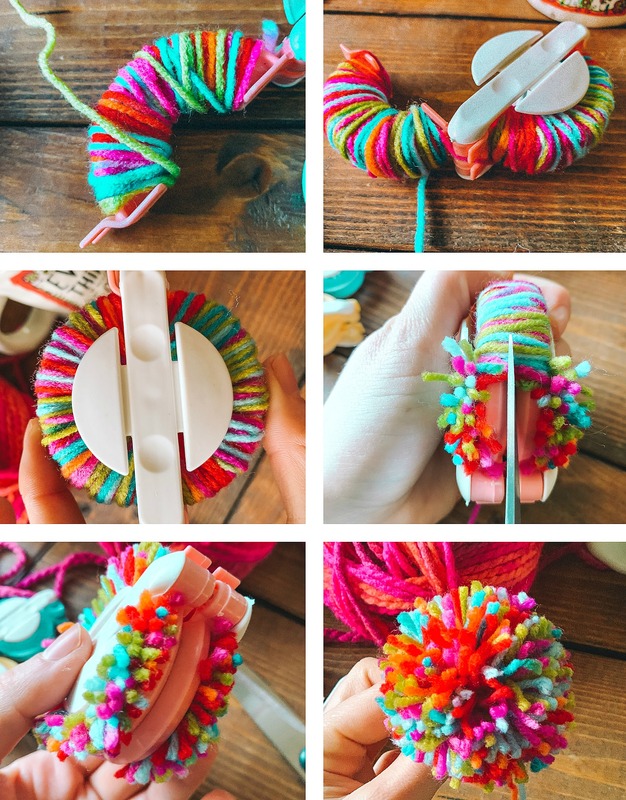 FYI I saw RedHeart online has a new pom maker where you can make multiple at a time…I may have to try it. Annnnd yes to more DIY! Oh wow! That is so awesome. I’ll look in to that and I love that you have your husband doing them!!! So cute! My grandma used to make us Pom Poms for our luggage when we would travel so we would know which suitcase was ours! She somehow made them with a fork though haha I would love to see more DIY! Awww!!!! I bet it’s gorgeous!! So cute! Yes to more DIYs and I think Valentines colors will be cute, maybe pale pinks, peach and purples! I would like to see DIY projects that include photos, I want to start displaying more photos around the house! 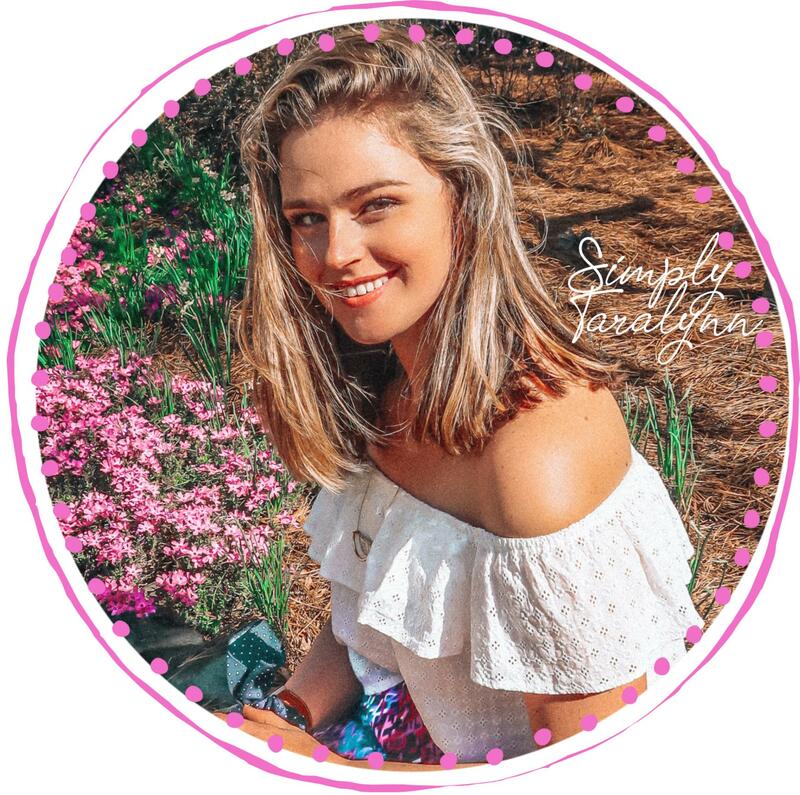 Have you been to the mall yet on your no spend challenge? This is such a cute idea! I’m thinking of making one for my classroom. Aw! 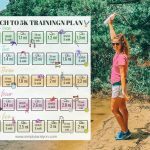 I bet your kiddos would love it! DYIs are very nice. This pom one was fun to read about, especially on a gray winter day. I think the colors are cheerful. 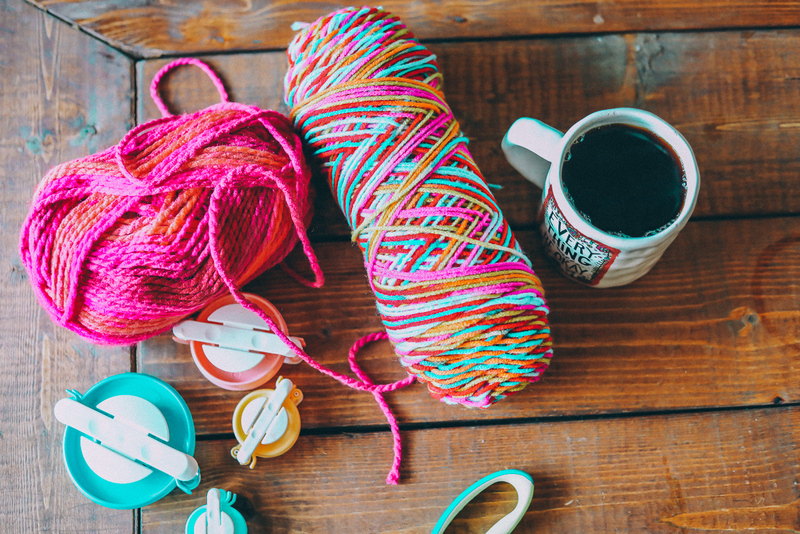 Imo, knitting doesn’t have to get too complicated or serious. It looks that way but there are some simple beginner patterns which repeat the same movement over and over. Probably best to have someone there who can teach it though. I think that’s why I wanted something so colorful! The winter blue is in full force. 💜❤️💛🧡💙💚 So fun! LOVE your colors! That blue door is adorable! YES more DIY. I love crafts! You should DIY bottle cap art! I want to so bad, just have to start collecting beer caps. I don’t know how i’d collect them lol. This is so beautiful! You should do pink and purple. You don’t even need the tool to do that! 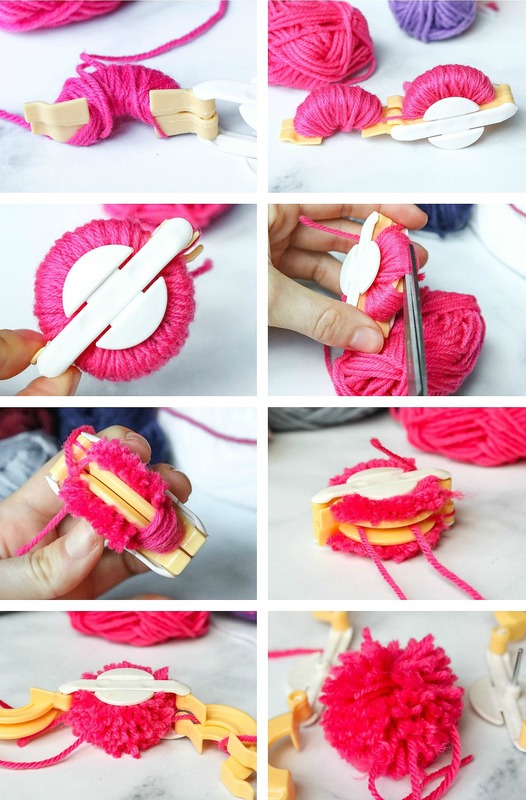 You can just wrap yarn around a rectangular piece of cardboard, tightly wrap yarn around the center, and then snip the ends and fluff. Or your hand. Or a fork (depending on the size you want).